"Have a safe trip home" & "Welcome home to the Africa Mercy"
I've said those two phrases a lot today. We had 47 crew leaving today. That means 47 pager beeps, 47 sets of sheets/towels to pick up, 47 mugs to collect, 47 disembarkation forms to sign off, and 47 people who are going to experience "reverse culture shock." This evening I welcomed 3new crew members. That means 3 dinners to reserve, 3 beds to check one last time, 3 cookie packs to place on their beds, 3 people to sit with over supper and make conversation, 3 people to introduce to their new roommates, and 3 people who are in for the experience of a lifetime. Those 3 new crew are SO young. Two of them are from the same Norwegian maritime engineering school and will be aboard for 8 months as "engineering cadets." The other girl's from Germany and will be replacing some of the Housekeeping girls who left today. I think they're 18, 20, and 21. They all looked like scared rabbits. Granted, Reception throws a ton of paperwork at them, I give them more papers at supper, there are papers on their beds, and there are even more papers taped on their doors. It's a bit overwhelming when everything is at a different time because we're on a weekend schedule... and then with the blackout everything has changed times once again. They're tired from the flights, nervous about being here, unsure of their new roommates, and the 18 year-old girl will be in a cabin alone until after the ship reaches South Africa. How's that for welcoming? Oh, and we have a blackout scheduled for tomorrow; the engine cooling systems are going to undergo a major cleaning in preparation for the sail--which happens to be 15 days away. So, tomorrow morning at 6am the ship will become deathly quiet and the emergency lights will be the only thing lighting up the corridors of deck 3. And with no windows down there, it's gonna be pretty dark. The blackout also means no toilets or showers (they both run on a vacuum system), cold meals from the galley, no phones (and that means no pagers either! ), no wifi, and no air conditioning. Decks 5 and 6 are going to be fine with all the windows, but the rest of the ship will be somewhat creepily lit. And I'm stuck on board. The rest of the crew will be heading off for a day at the sports complex and a free BBQ cookout. I'll be here. But I think I'm gonna get up at 5 to take a shower and get a cup of coffee while it's still hot, go watch the sun rise from deck 8, and then make my way down to breakfast at 7am. Spend the day studying for the GRE--one of the few things I can do without any power, reading a book--it's been a while since I did that, and catching up on some much-needed sleep. I was just thinking about it all as I was cleaning up from the new arrivals' supper. I love my job on days like these. I feel needed. I AM needed. Ok, the pager beeping is REALLY annoying; especially when you're in the middle of a good book, trying to catch some sun on Deck 8, just settling down for devotions with a great cup of hot coffee, or you're sitting down for 2 seconds to rest your tired feet. But I get to be one of the last crew members that people see and as I leave their cabins with pillowcases full of dirty linen in hand I call back, "Have a safe flight!" And just now I ran into a group of girls playing Settlers of Catan in the dining room. Most of them lived in the 8 and 10-berth cabins (there is only one of each on board.. the majority are 4 or 6-berths), and are used to lots of roommates and making new friends quickly. So I told them about the new girl alone in cabin 4338 and asked them tomorrow to stop by and say hi. Take her out to the sports complex for a hot BBQ lunch, or at least sit with her over cold cereal tomorrow morning. Make her feel welcome because there's only so much I can do. I'm known as one of the faces in a white uniform shirt/black skirt--just part of the system. I give them papers, take them to their cabins, tell them about the 2-minute shower policy, and say goodbye. I've come across so formally that it's often hard for the younger new crew members to realize that I want to be their friend. Only 6 weeks ago tonight I was in their shoes. Just as lost and confused and turned around as they were. It's gonna be OK. And no, not everything will be fixed with a hot dinner, a shower, and a clean bed. I'll be around all day tomorrow for them to ask questions, but they need some friends. And with 47 people gone, the ship seems a lot more empty. But I can smile at them, slow down when I talk, and eliminate American phrases from my vocabulary. I can make things easier for them. And sometimes a plate of cookies and an offer for them to join me for a movie night can make me magically turn from someone who's part of the system into someone who's a fellow crew member. And I think I can do that. There are new faces everywhere. Open up your eyes. Yes, I get a nice little list of who's coming and going. I have to say goodbye and hello. But you don't. There's a lot that you don't HAVE to do that would really make someone's day if you WOULD do. I'm way over on the left side in front of the group of people standing on top of the land rover. :) Click the picture to open it in a new window and look for me standing between the two people wearing greenish-blue shirts, all you can see is my face. BTW, the lady in the greenish-blue polo is Kathy, my boss. Every Friday afternoon at 5pm a group of people go out to play Ultimate as a sports complex about 10 minutes away. I've been either working on Fridays or doing something with friends and so this was the first week I could go. It was quite an experience! The complex was pretty ghetto... think one soccer field that was half mown--the other half had grass/weeds about 18" tall. And there was a 10' wall around the place, but when the frisbee went over the wall there was always a little child ready to scramble the wall and throw it back over! There were several groups of men playing football (soccer) going on when we got there, and a bunch of little boys were playing the dirt, maybe waiting for someone to bring a ball. When we started playing they quickly picked favorite players to root for! Sometimes when a crew member dropped the frisbee or missed a catch we'd hear a bunch of scolding--in French. But how they cheered when someone scored, made an amazing catch, or dove and caught it! We all came back totally exhausted, totally soaked (the mini water fight that happened on the dock as soon as we arrived back did contribute some! ), and our feet totally sandy! But it was so worth it! At 11am I handed the pager off to the Chief Steward, and we all piled into a Land Rover. We had to fill up at the petrol station just outside the port and then got caught in traffic.. made for some good pictures of the road-side attractions! When we finally got to Sarakawa, we headed straight for the pool out back and ordered lunch from the pool-side cafe...then came out the Phase Ten cards as we waited for our food. We stayed there until about 4pm when we headed back to the ship and arrived just in time to get in the crew-wide photo that the Communications Department took immediately following the fire drill--which we conveniently skipped! It was such a fun afternoon to relax, enjoy time together without any work stress, and to unwind after the thank you function. ...then Kathy told us to push it off until next week! This morning at 9am we said goodbye as Sarah left for the airport on her way back to the States. Mixed feelings all around... it's good to be moving on, but hard to leave the Mercy Ships family behind. Cream butter and brown sugar together. Combine instant coffee and water in a small bowl. Add coffee mixture and egg and mix well. Combine salt, baking powder, and flour in another bowl and then add to wet dough mixture in small amounts. Roll out dough on a floured surface to ⅛” thickness. 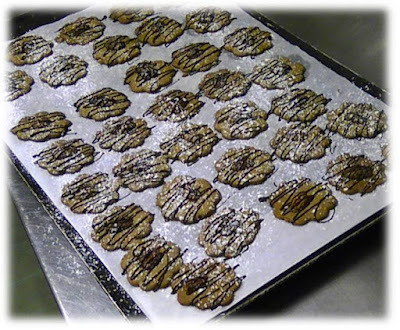 Cut out cookies and place on baking sheet ½” apart. Top each cookie with a pecan half and gently press it down. Bake at 350* for about 10-15 minutes. Cookies should be darker brown and slightly crunchy. Melt chocolate and oil together and spoon into a plastic bag. Cut off a tiny corner and drizzle chocolate thinly over cooled cookies. Sprinkle powdered sugar over the top. Place cookie sheets in the refrigerator for a few minutes to harden chocolate before placing cookies in storage containers. Thank You Function... in the can! The end-of-field-service thank you function is officially done... and the entire Steward's department is just a little bit happy! Hospitality Dept. - made mocha pecan cookies and glazed orange teacakes, extra-carefully ironed/re-ironed white tablecloths, made platters of food, made food-label cards in French/English, washed creamer/sugar bowls, sterilized cups, bleached the white mugs free of coffee stains, ordered flowers, set up the entire dining room, served for the function, tore down the dining room, washed all the dishes... and solved about 5 million minor emergencies! What a day. It started at 8am with Steward's Dept devos in the cafe, and didn't finish until about 5:45 pm when the last dish was washed, tablecloth taken to the laundry room, and leftover either put in the Hospitality freezer or put out on the line for the crew's dinner. Ok... the day itself wasn't long... but the working quickly all day and the perfection required during the event was what stressed me out! About 15 minutes after the guests started arriving Peter, the Chief Steward and Kathy's boss, asked me to wait on the head table--just make sure their glasses were filled and a new person was offered a drink choice within about 30 seconds of sitting down. That was fine... but I really hate serving important people. I mean we had a representative of the Minister of Health, a representative of the Togolese presidency, several ambassadors (I heard American, Swiss, and German were invited), and high up people in both Total Petrol and EcoBank, two companies that have supplied our fuel and banking needs. I don't know who was actually sitting at my table--but all I know was that I did not want to interrupt conversation to simply ask, "Monsieur/Madame, would you like juice or water/coffee or tea?" Grrrr... what is it with me just wanting to be in the back washing dishes or refilling juice pitchers and I get stuck serving for the Vision Trip or the head table? There was a table at the front of the dining room with several platters of food, but they were mainly for display... there were about 15 servers meandering through the crowd with trays of food, drinks, and refill pitchers. It was the first time the ship's done "tray service" for a function before... we were all nervous as to how it would work out, but it went off without too many hitches! (orange glazed petit fours. these things were kind of a disaster. Try making 7 batches on Friday--and the food coloring bottles here do not have nice little droppers that allow you to make different batches on consistent color. Then try the cookie cutter breaking as it cuts through the frozen cakes. Then try the glaze not entirely covering the cakes on the first go-'round. Then try the glaze not drying in time for you to put on the little swirly icing designs. Tuesday night Abi and I joined the Jesus Film team from the ship for an exciting evening! The 7 of us packed all the sound equipment, projector, and huge screen in the back/top of the Land Rover and took off. Destination: in front of a local church about 8 km (~5 miles) away. Tuesday nights the team doesn't go out as far; the Friday night trips often take up to two hours to get there! Along the way we stopped at the Shell petrol station to fill up a petrol can for the generator to power the projector and sound system. We pull up in front of the church, align the Land Rover just right so that we could hang the screen off the back, and in about ten minutes the entire setup was complete! There were plastic chairs set up for about 50 people, but only a few moms and babies were running around when we got there. We started off with a prayer, some singing (which in Africa also means dancing! ), and generally worshipping. It's pretty common to all dance around in a circle--how they pick the direction, I don't know!--and after a few times around the little ones pulled Abi and me into the circle. We both danced/clapped as best we could and tried to pick up the songs. And then the film started. It gets dark really early here (about 6:30pm), but it was a full moon... which made for a really cool setting for the crucifixion scene! Then Pastor Marc, a day volunteer who organizes the Jesus Film locations, paused the film with the shot of Jesus on the cross and began to share the gospel. He gave an invitation and 5 people came forward to pray with him. Then they were ushered into the church to talk with one of their pastors as we watched the rest of the movie. When the film finished, we packed up, the the church pastor invited us in for cold drinks. We helped to carry all the plastic chairs inside and then sat and talked for a little bit. It was so weird to hear them thanking us for bringing the gospel to them--all we did was bring a DVD, a projector, some speakers, and a glorified white sheet. But maybe it was more of a roundabout way of thanking God for bringing in 5 more children. #1 - Lome is a BUSY port! The cargo ships that dock next door unload probably 18 hrs/day. They're here for three to four days and then you wake up one morning and they're gone. They're carrying all sorts of things; frozen fish packed in dry ice (we were all glad when our smelly neighbor moved on! ), rolls of wire, bags of rice, bags of cement (we were also glad when that neighbor left and stopped covering our entire pier, Land Rovers, and ship exterior in cement dust). Some ships come in so heavily laden that the tops of their cranes only come to about our deck 6. And then as they unload they "magically" rise out of the water, revealing their full ship name, and their badly-in-need-of-paint hull. Sometimes you wonder how much they can hold. It seems like hundreds of semis drive away from their pier, all carrying pallets stacked so high you hope that the load doesn't fall off and squish anyone. And you wonder how much of that frozen fish the Togolese people will actually see. Will that cement actually go to help build new buildings, homes, and schools? I am also a vessel... albeit not a sea-going vessel. What I am unloading is important, but I might say that the consistency of what I'm unloading is perhaps more important. When a ship comes in, we can quickly tell what it's carrying--when we see the ship unload the same cargo day in and day out for its entire berthing we can then say that the ship fulfilled its duty. Have I come and unloaded happiness, joy in the mundane, sincere smiles, hard work, and a gentle attitude that refuses to get easily offended? Have I continued to unload that cargo or have I switched to the less desirable cargo hidden way down deep in the cargo holds... cargo that does no good to its recipients and only acts as dead weight? #2 - The African people know how to dress colorfully! What is it with brown taking over the Western fashion world? How about orange, purple, lime green, turqoise, and yellow? How about all those colors in one piece of fabric! Africa people also know how to dress appropriately. They would never dare to wear their market-going clothes to church. They would never wear their one pair of nice shoes to play "football" in. At church this morning I noticed that even the babies/toddlers on their mothers' backs are dressed for church--although they will probably fall asleep and stay wrapped up on her back the entire time. If you walk down one of the crowded market streets you'll see stalls selling African fabric by the 6-meter pieces right next to stalls selling "Calvin Klein jeans" and stalls with piles of used clothes for sale. The fabric is way overpriced usually, the jeans are knock-offs that probably won't last more than a few washings, and the used clothing most likely came from Western countries' donations to be dispersed to "the world's poor" but got taken in by a middle man and taken to the markets for sale. If you drive down the Beach Road on your way to almost anywhere you will see businessmen dressed like we'd expect, women wearing colorful African dresses and fancy shoes, babies and toddlers running around in only underwear, children wearing dirty t-shirts with English words on the front and skirts/pants made of African fabric, young men with t-shirts full of holes and faded jeans and super cheap flip flops. They're wearing anything and everything. Some have a choice of what to wear, some wear what they can afford/someone gave them. Some have more clothes at home, some don't even know where home is. But they've all got something on. And you can't consistently unload what's not put on the ship before it embarks on its journey around the world or around the block. Can't put my finger on the mood. It's not melancholy, anger or the blues. I love my husband, my house, my job. Couldn't be any better, and really what else is there? and that's the root of all my misery. Lord, first of all, how is it between You and me? How is it between us? How is it between us? and what has happened since?" This pretty much described my day. Well it actually started last night when I got the pager at 10pm from Sarah because we were expecting an arrival early, early this morning on my duty day. I was annoyed to have the pager early instead of at 8am this morning, especially when Gabriella told me that the arrival wasn't actually coming in until the afternoon. This morning's crew-wide devotions were optional, and so I set my alarm for 7:40 to be at work at 8am. I hit the snooze and when I finally dragged myself out of bed it was 7:55... OK, I can still make it. And then at 8:01 the pager goes off... two crew members needing to check out. I get to their room and by the time I check it out it's 8:20. As I drop off their linens in the laundry room the pager goes off again... this time with a text page from Gabriella asking where I was and if I was coming into work... great. Kathy is such a moderating influence in the department and when she's in the office it cuts down a lot on the slacking, the pushing off work, the complaining, and the sitting around waiting to be told what to do next. But Kathy took yesterday afternoon and today off so she could finally go to Ghana with some others. We sorely missed her. At one point I almost blew up at one of the other girls and decided it would be better for everyone if I cleaned the next cabin alone. I was really wondering what was making the day so horrible... granted, neither Sarah, Caitlin, nor Gabriella wanted to be at work today. We all had fun plans for the weekend. Sarah was feeling really badly. Caitlin was anxious about the burn she got from the muffler of a moped taxi she rode last week. And Gabriella was still rather asleep! But then I heard this Sara Groves song on my MP3 player and just had to stop for a moment. How is it between us? You know, I really could ask myself that about a lot of relationships? How is it between my cabinmates and me? My co-workers and me? My parents and me? My brothers and me? My friends from home and me? My friends from school and me? How is it between God and me? And that question must be answered every day. You cannot store up devotions for a rainy day. You cannot work ahead. You can't cram them all in so you don't have to worry about it for a while. So I ask you... how is it between you and God? Monday saw our department setting up for another Vision Trip luncheon with the senior management. Sarah was off because she had worked the weekend, so it was just Gabriella, Kathy, Caitlin, and me. clearing the tables afterwards... Caitlin's always so photogenic! Fou-Fou, French nails, and "Dear John"